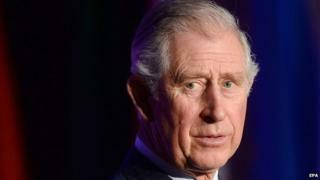 The Supreme Court is to rule next week on whether Prince Charles's letters to government should be made public. The Attorney General's Office is appealing against a Court of Appeal ruling that it unlawfully prevented letters being released. Guardian journalist Rob Evans applied to see letters to seven government departments written in 2004 and 2005. But it has been argued that releasing the letters would undermine the principle of the heir being neutral. The Guardian newspaper said it had been "pressing the government" for nine years to see the letters, written by the Prince of Wales between September 2004 and April 2005. Mr Evans's requests, under the Freedom of Information Act 2000 and the Environmental Information Regulations 2004, were initially denied by the information commissioner. Using his veto in 2012, Mr Grieve said any perception that the prince had disagreed with the then Labour government "would be seriously damaging to his role as future monarch because if he forfeits his position of political neutrality as heir to the throne, he cannot easily recover it when he is king".